In this video Mark Donovan of HomeAdditionPlus.com reviews Post Shields. I recently received in the mail a simple but neat little set of products for protecting 4×4 wooden posts from lawn mowers and grass trimmers. 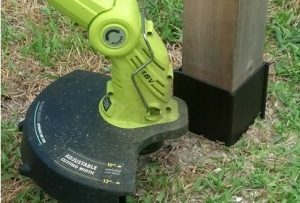 They are called Post Shields and are ideal for installing around 4×4 mailbox, deck, and fence posts. Besides protecting posts from mowers and trimmers, Post Shields also mitigate the risk for post damage caused by insects and moisture. Damage wooden posts are more susceptible to insect infestation, and water retention, that can cause wooden posts to rot and break over time. The installation of Post Shields is quick and easy. Just assemble three of the side panels together by sliding each panel into the locking track of the other panels. Then wrap them around the base of the wooden post and slide the last panel into place. Post shields are made of durable high impact plastic and come in black, white and bronze. They can be purchased online at Post Shields, Inc.. For homeowners they can be purchased either in a single set or a package of four. At the time of this writing, the single set costs $7.50 and the four pack $24.99. For landscapers who may be interested in purchasing them in bulk for their customers, they are available in 32 packs for $120. So if you want to protect your wooden posts from damage and eliminate scuff marks caused by mowers and grass trimmers, I’d recommend Post Shields as a simple and effective solution. Dress Up Your Home’s Exterior with an Arbor – If you’ve always wondered what to do about a side door entrance to your house or garage to make it more appealing, or just wanted to simply spice up the backyard, building an arbor may be your answer. The “How to Build an Arbor Ebook” provides detailed, step-by-step instructions and pictures on how to build an entrance-way arbor for your home. Order and Immediately Download today!. 100% Money-Back Guarantee if you are not satisfied. Planning to have a Brick or Paver Walkway Installed by a Landscaping Contractor but not sure what questions to ask to ensure you hire the right one? See HomeAdditionPlus.com’s Brick and Paver Walkway Bid Sheet. The Brick and Paver Walkway Bid Sheet will help ensure that your walkway project goes smoothly and you get the finished walkway you are looking for.